The Most Exciting Day Camp in Calgary! PD Days, Spring Break, Summer and More! Sign up for one of our Day Camps! Need to keep the kids busy and having fun for the day? 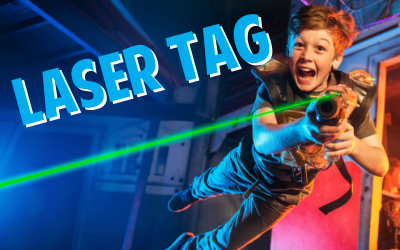 We've got just the thing with our Laser Tag and Mini Paintball Day Camps. Half the day is filled with Laser Tag! Play with other day-campers and light up the arena while playing different games of laser tag. Team Battles, Free-For-All and a couple specialty games will ensure your day-camper leaves the arena a laser tag pro! The other half of this adrenaline-pumping day is filled with Mini Paintball! Mini Paintball uses smaller paintball guns and smaller paintballs shooting at slower speeds! 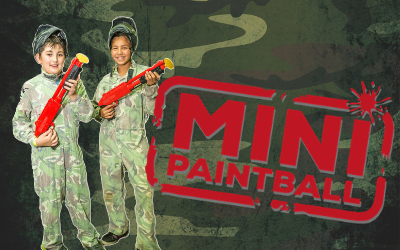 Campers will kit up in camo coveralls and a paintball mask before they hit the specially designed paintball field to play Mini Paintball! We supply all the gear and all required paintballs. A group leader will teach everyone the safety rules and lead a variety of games. Our day camp includes a pizza lunch and two snacks to keep our campers fueled up and ready to go! Water is available during snacks, as well as pop at lunchtime. Late pick up is available for $15 for your child to stay as late as 6pm. We will keep your child busy playing a couple extra rounds of laser tag! Summer 2019 dates are coming very soon! All players will need to sign a paintball waiver in order to play paintball. Waivers will be collected when the player is dropped off. You can download the waiver here, or sign it when you drop your child off. If a child does not have a waiver they will not be permitted to play paintball. Late pick-up is available until 6pm for an additional $15. Please book this in advance. Tickets must be purchased in advance - there's no on-the-day drop in available. All dates are dependent on a minimum number of registrations to run - register with your friends! Register Today For Day Camp!